Las Vegas. It’s a dead end for some and paradise for others. Maybe it’s a little of both for Bonnie Brae. It’s 1957. A lot of water under the bridge since things heated up a couple of years ago. The plan had been to go incognito, start a new life in San Clemente as Marie. But, no, Marie was not going to be left alone so easy. 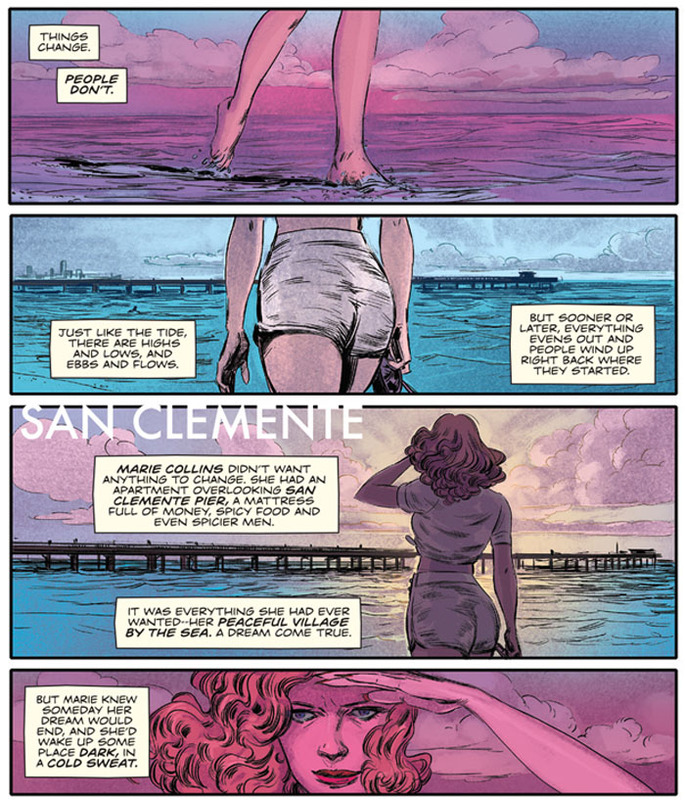 If you were a fan of Hit: 1955, or if you’re new to the party and looking for some good noir comics, this new Hit series is for you. 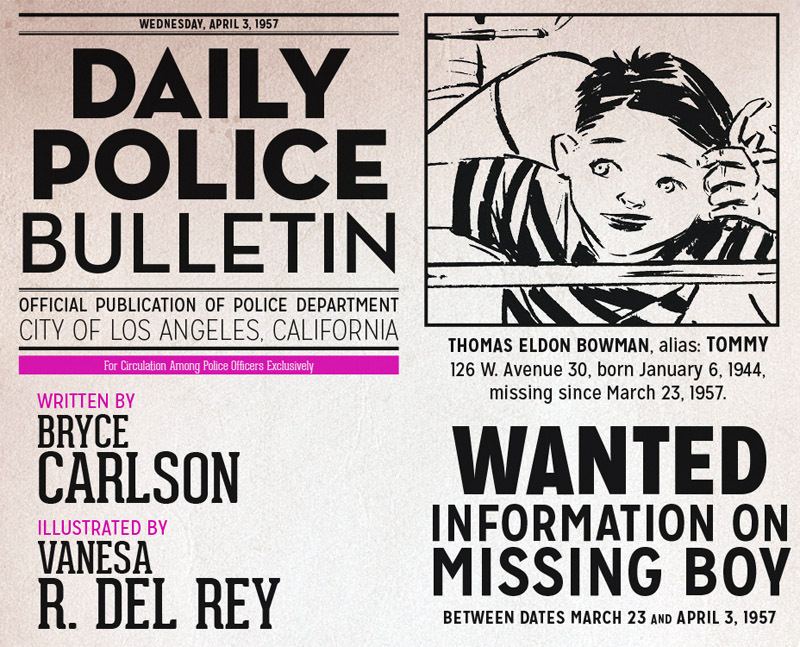 You’ve got the team of writer Bryce Carlson and artist Vanesa R. Del Rey back to deliver more. Each page is teaming with intrigue graced by Del Rey’s fluid line and Carlson’s gritty narrative. Los Angeles is one big corrupt mess. We find our anti-hero Detective Harvey Slater pushing back on Domino and his Syndicate. He can’t catch a break from the boys in Internal Affairs. And Bonnie Brae is missing. But that is only the beginning. We have ourselves here a deep and dark tale unfolding. Much transpires. A new killer on the loose. And, of course, you didn’t expect Bonnie to just sit still all this time, did you? Good crime fiction needs to establish a rhythm quickly and then maintain it. Set up your hooks and beats. Cue the atmosphere. Lower the shades. Carlson loses no time creating a pattern and evoking a certain kind of melancholy. You need doomed characters who don’t know they’re doomed. Carlson rolls out our ongoing theme: “Things change. But people don’t.” Del Rey works wonders with her brush: scribbles here form a shadow, overlapping lines there build up to loose crosshatching signifying lust, despair, and a cavalier stare back at death. 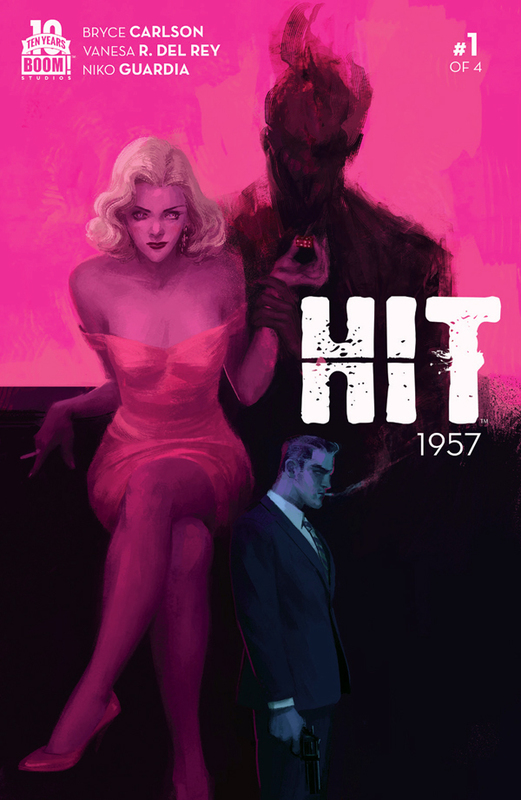 “HIT: 1957 #1” is available as of March 25. For more details, visit our friends at Boom! Studios right here.